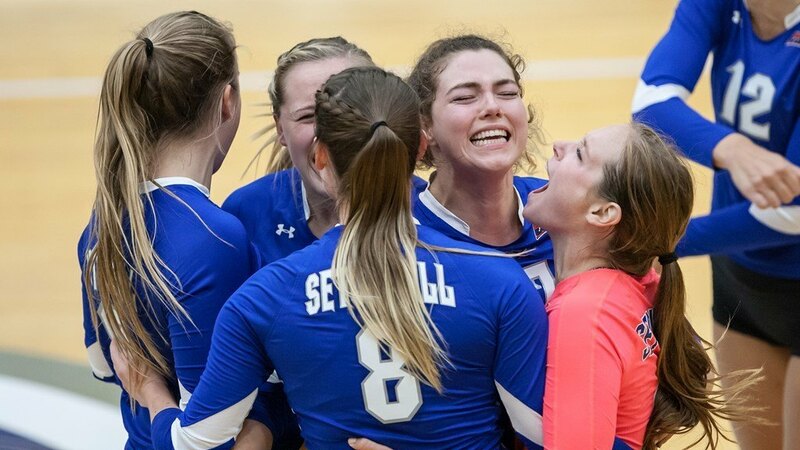 Class of 2019 outside hitter Kyliegh Dana has verbally committed to the Seton Hall University women’s volleyball program. Dana will be a senior for the 2018 season at John S. Burke Catholic High School in Goshen, New York. On the club side of things, Dana plays with YMCA Lady Elite. Standing at 5’10” she owns a 7’0″ standing reach, an 8’7″ block touch and a 9’8″ approach jump according to her NCSA Recruiting profile. Highlight video of her play via Vimeo can be seen here. It’s also the second class of 2019 commit for Seton Hall that has been registered in the VolleyMob Recruiting Database. Joining Dana for next year is set to be MacKenzie Huntley, a middle blocker/right side from Texas. Dana is also set to join a position group for the Pirates that has four outside hitters for 2018, but with three seniors set to depart prior to 2019. Seton Hall finished the 2017 season at 16-15 overall and 10-8 as a member of the Big East. Their 2018 campaign begins on August 24 in the Blue & White Classic where they will face North Dakota State, Buffalo and Niagara in the opening weekend.